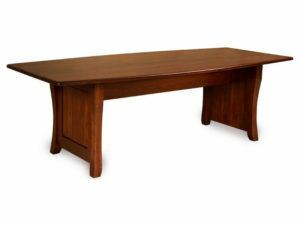 Conference tables from Brandenberry Amish Furniture are ideal for organizations or businesses that wish to project a truly professional image. Amish cabinetmakers painstakingly handcraft each trestle conference table from solid hardwood. So they’re incredibly sturdy and durable. 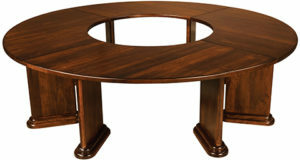 The Berkley Conference Table is accented with a curved edge and raised panel base. Most conference tables on the market include bargain substitutes like veneers, particle board and metals. But not those from Brandenberry Amish Furniture. Because Amish artisans custom-build each table from solid hardwoods. Like oak, cherry, maple and hickory. So you’ll enjoy the rich, genuine woodgrain. Plus perfect fit and finish. What’s more, our builders make the tables extremely sturdy. Which means with proper care, they’ll occupy the focal point of the conference room for generations to come. You can order the wood conference table of your choice as shown. Or, we can customize it to your specs. And your choices include the wood specie and finish. Plus other features like the table length. In addition, you can select from a plethora of conference room chairs, and other office furniture. Amish cabinetmakers build them all from solid hardwood.